Masrawy Kitchen is the best Egyptian restaurant in Mississauga. The popular Halal restaurant in Mississauga is located in the heart of the city’s vibrant Egyptian community on Britannia Road West. Masrawy restaurant specializes in serving authentic Egyptian cuisine. Its menu features popular dishes from Egypt such as Besara, Koshari and Kofta. Mohamed Salah Saleh is the founder and owner of Masrawy Egyptian Kitchen, the GTA’s first dine-in, Egyptian soul food restaurant. As a young and ambitious entrepreneur, Mohamed built Masrawy Kitchen from scratch. Masrawy began in 2014, as Mohamed created the first professional Egyptian catering company in Toronto. Masrawy Catering went on to cater both private functions such as weddings and engagements, as well as corporate feasts for Amazon, Proctor and Gamble, Microsoft and KPMG. Mohamed opened Masrawy Kitchen because he saw that Egyptian cuisine was not readily available at restaurants in Mississauga and Toronto. While almost every ethnic group had restaurants serving their national cuisine, Egyptian food was typically only found in the homes of local Egyptian families. As the first professional Egyptian caterer in the GTA Mohamed takes great pride in having paved the way for Egyptian food to make its way into the city. Over the last year, many foodies in Toronto whispered about a popular Egyptian caterer in Mississauga. And as Masrawy Kitchen continued to grow its client base, it became clear that opening a restaurant was the next step. 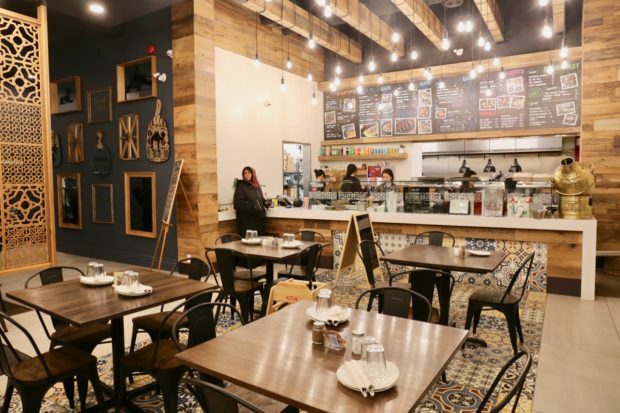 In 2018 Mohamed made his Halal restaurant dream a reality, opening Masrawy Egyptian Kitchen to the Mississauga masses. The dining room at Masrawy Kitchen in Mississauga. Egyptians have made Canada home for decades and the community in Mississauga has contributed a great deal to the growth and development of the GTA. Masrawy restaurant is a source of pride for Egyptians who confidently recommend its menu as the best local joint to enjoy Egyptian cuisine. Tears have also been shed as customers who are new immigrants to Canada, find happiness in a bowl of familiar Koshari. Masrawy Kitchen has been outfitted with authentic Egyptian décor that also blends with a playful and modern hipster vibe. Exposed ceilings are juxtaposed beside traditional, hand woven Egyptian tapestries. 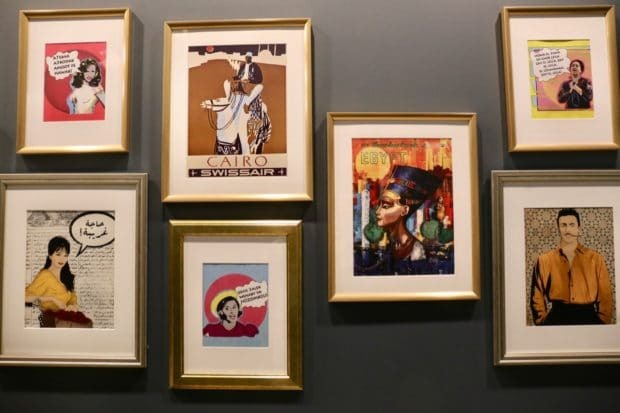 Skip to the bathroom and you’ll find a hallway adorned with a gallery of frames featuring classic Egyptian iconography. Masrawy Mississauga can seat a total of 60 guests. The space also features a semi private dining area that can host up to 30 diners. The entire dining room as well as the semi private space are available for private bookings. The Masrawy dining room is perfect for hosting rehearsal dinners, engagement parties and networking events in Mississauga. Hipster Egyptian art at Masrawy restaurant. Unlike other Middle Eastern cuisines, Egyptians truly have an eclectic set of traditional dishes. Masrawy’s menu covers all the bases, from Koshary, Hawaoshi and Molekheya, to Kebda, Taameya and Foul. There are many classic Egyptian dishes on the menu, but you’ll also find some fusion dishes too. 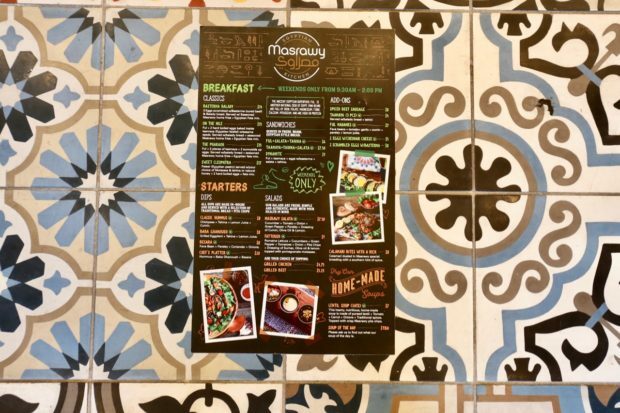 Masrawy’s most unique menu can be enjoyed during their weekend brunch service. It’s the best Halal brunch in Mississauga, mixing Egyptian staples with Canadian classics. Masrawy’s menu also offers plenty of vegetarian and vegan options. The Masrawy Kitchen menu features popular Egyptian dishes. The kitchen at Masrawy restaurant offers a plethora of healthy halal Egyptian dishes. You’ll find dips, soups, salads, hearty mains, savoury sides, desserts and a creative brunch menu. Lentil Soup: hearty and healthy soup featuring blended lentils, carrots, onions and Egyptian spices. Besara is a classic Egyptian dish. 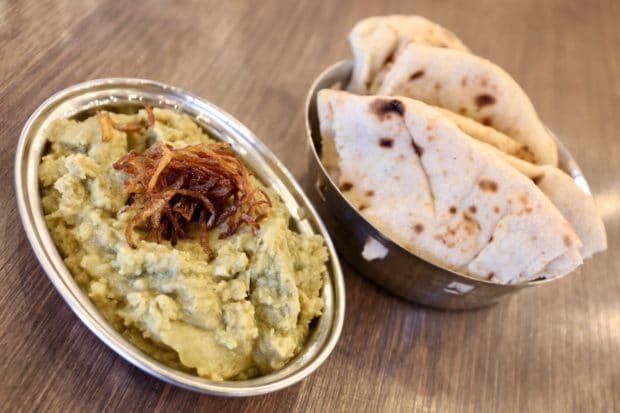 The dip is a puree of fava bean, parsley, coriander and onions. Kedba Eskandarani: beef liver, peppers, onions, garlic served on a sizzling pan. Balady bread and tahina. 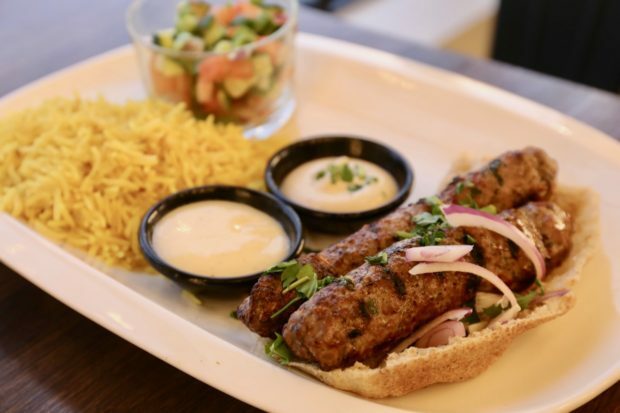 Egyptian Kofta: seasoned ground beef, lamb skewers served on pita bread. Grape Leaves: fresh rolled leaves stuffed with herbs, tomato and rice served with yogurt dip. Egyptian Beef and Lamb Kofta at Masrawy in Mississauga. Basterma and Balady: 3 eggs scrambled with basterma (cured beef) and balady bread with home fries and Egyptian feta mix. On the Nile: ful, 2 hard boiled eggs baked inside taamaya (Egyptian falafel) with sesame seeds. The Pharaoh: ful, 2 pieces of taamaya, 2 sunnyside eggs with balady bread and home fries. 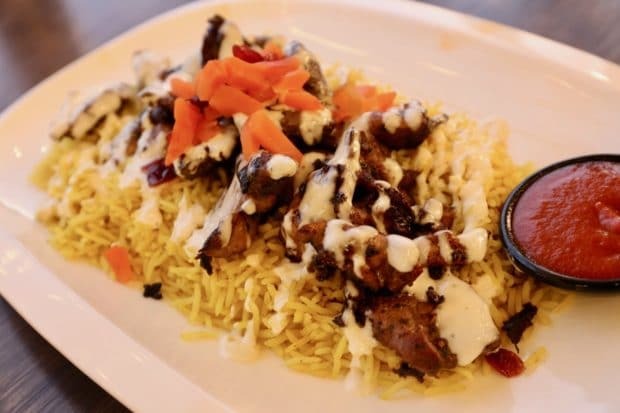 Chicken and beef shawarma are served at Masrawy Kitchen with seasoned rice, garlic sauce and hot sauce. 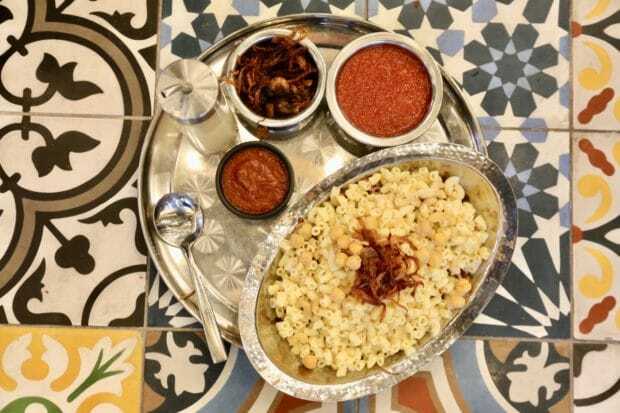 Koshari, Egypt’s national dish, is perfect for sharing with friends. Roz Bel Laban: sweet and creamy rice pudding. Basbusa: sweet semolina coconut cake topped with roasted almonds. Kunafa: Kataifi dough pastry, sweet and crunchy, filled with cream and topped with pistachio. 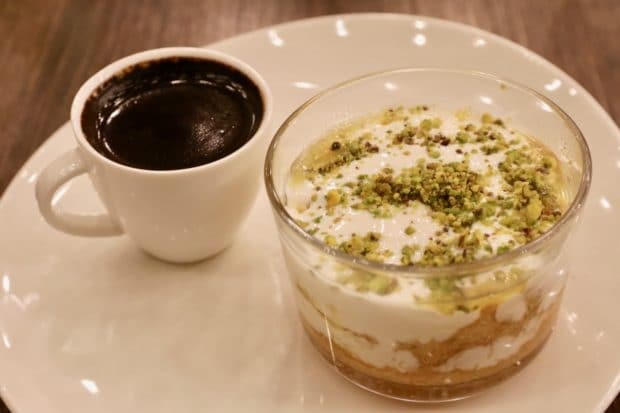 Kunafa with cream and pistachio served with Turkish coffee.